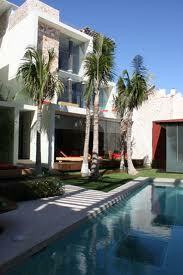 Playa del Carmen preconstruction condos and finished condos have been extremely popular over the past several years. As many buyers coming to this city are seeking properties for winter escapes or for their second homes, the concept of owning property through a joint community is very appealing to many non-Mexicans. Many condos in Playa del Carmen have been designed with this criteria or this market in mind when they develop and construct these buildings. Another feature that is attractive to investors and buyers of the condos here in the community is the rental demand. Mexico has been seeing steady increases in the visitors coming to this country every year. With projections estimated of double digit increases in tourism, the demand is outpacing the available room units that exist in the Playa del Carmen condo market. Due to this high demand of rental units, a new concept of ownership with in-house rental management emerged for the area approximately four years ago. This hundred percent ownership concept involves purchasing a condominium within a hotel designed infrastructure. Such a building will have a reception area, an administrative office/s, amenities such as pools, small kitchen and restaurant. The choices of placing your Playa del Carmen condo within a rental pool is completely dependant on the owner. If the owner decides to maintain the condo locked up during his time away from the unit is a choice completely dependant upon the buyer. Many times the owner welcomes the idea of a professional marketer and hotel administrator taking control of the units for the optimal service of the property.